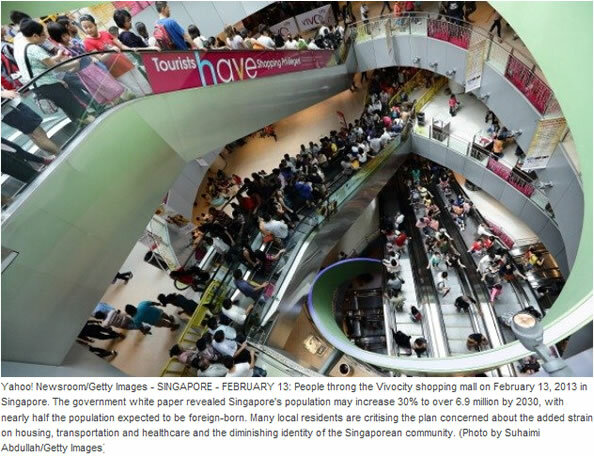 Excellent use of infested shopping mall picture by Yahoo News in its article - Sillyporeans among world’s top 10 pessimists. Sillyporeans need to ask themselves if buy buy buy, consume consume consume is gonna elevate their well-being. Certainly more material possessions make one happier but after basic needs are met, simply chasing more, more & more have resulted in negligible marginal utility. In fact Sillyporeans end up among top 10 pessimists. Warning signs are already there: some Sillyporeans buy & buy till they are buried by their possessions & have to rent extra storage space, becoming slaves to their mountain of stuff. Are slaves optimistic? Gallup's survey result is nothing shocking. I have warned about the toxic effects accumulating under the hybrid regime's grow GDP at all costs like cancer approach. 1 of the central themes of this blog is hyperconsumption in Sillypore. Shopping malls growing like weeds in this tiny island. More & more malls = Less & less well-being. What i observed is that the script by the hybrid regime is to overwork the masses to turn them unhappy. Once unhappy the masses will turn to retail therapy to buy (yes, the damn GDP again) a bit of temporary happiness- vicious cycle. Very good. I agree with you. But as a commercial REIT investor, I wouldn't want the incumbent gov to be displaced. Best is to invest here, but live outside sg.